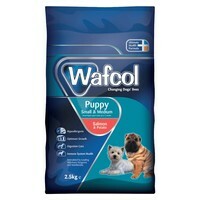 Wafcol Salmon and Potato Puppy Food for Small and Medium Breed Puppies provides a highly palatable and nutritious food that has been formulated for optimum growth and development. This tasty puppy food is a hypoallergenic, using salmon and the single source of protein and potato as the main source of carbohydrates. It is free from wheat gluten, maize, barley, rye, oats, red meat, poultry, dairy products, soya, artificial flavours and colourings. By feeding a hypoallergenic food, your puppy will not be exposed to many allergens and lowers the risk of symptoms developing in later life.